From consultation to celebration! 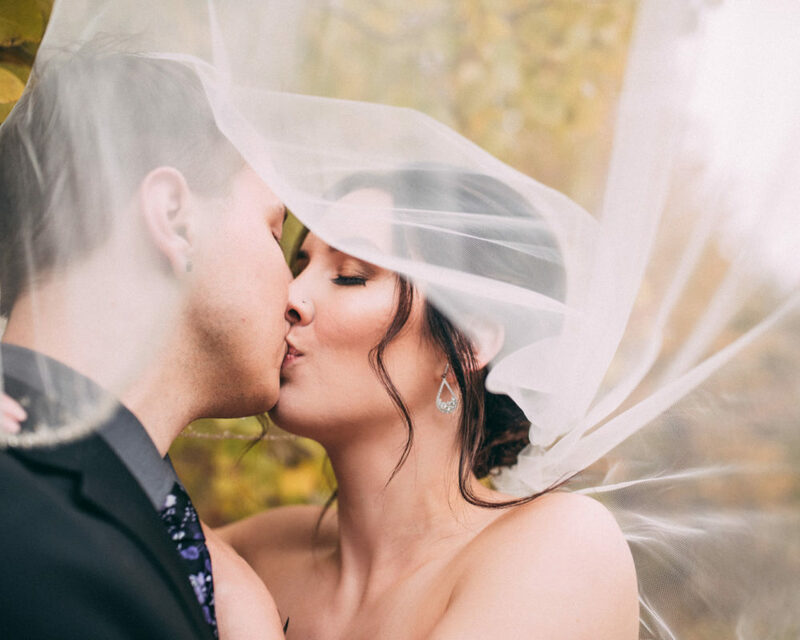 Our wedding coordinators, decorators, designers and stylists will work together to prepare a lovely presentation for your wedding guests that will make your newlywed hearts happy. Our curated white & gold ‘Sweet Love Dessert Package’ will make hosting a bridal shower or an engagement party seamless. 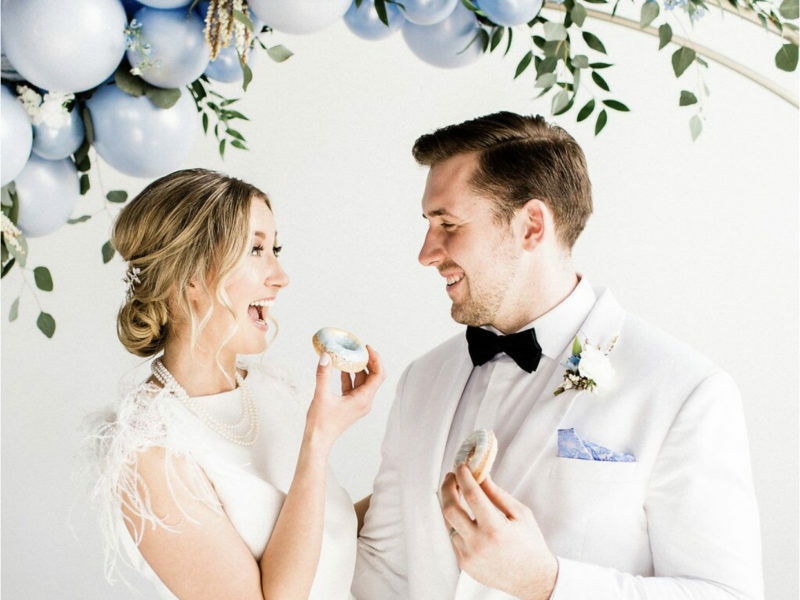 Cake topper and cookie favours will be personalized with the happy couple’s names. All desserts will be accented with gold metallic. Open boxes, set out your plates and set out our desserts! *Please note menu items or flavours may not be substituted. Call the bakery to order the ‘Sweet Love Dessert Package’ through our wedding coordinator. Order minimum 2 weeks in advance. 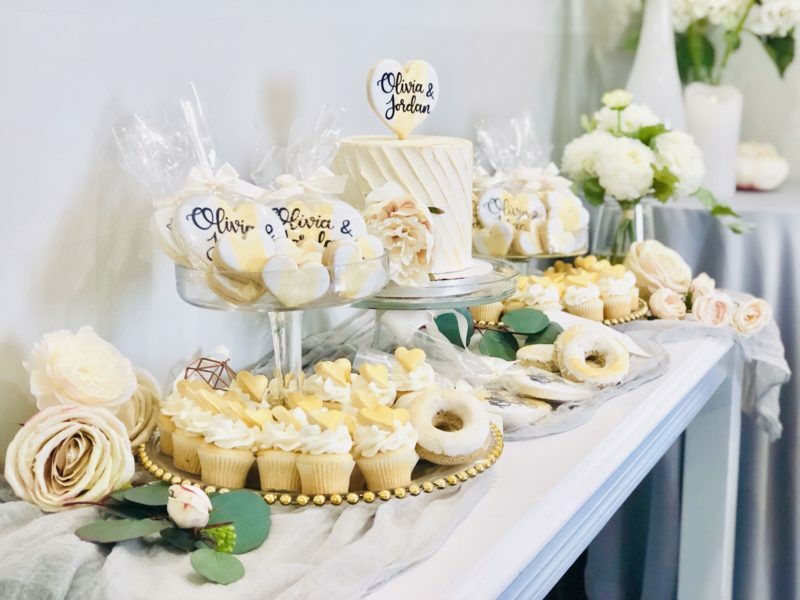 Beautiful buttercream wedding cakes are decorated with subtle textures, fresh flowers and include a hand-decorated cookie topper personalized with your names. Our artistic cake decorators can include watercolour hues, metallic elements, hand piped intricate details, and modern designs for an additional fee. 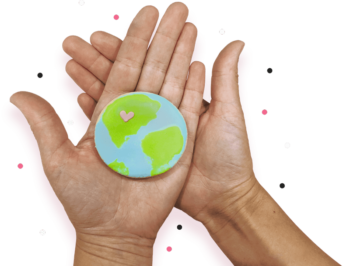 Creative and thoughtful thank you favours your guests will love. Custom wedding colours will be included with your favours. 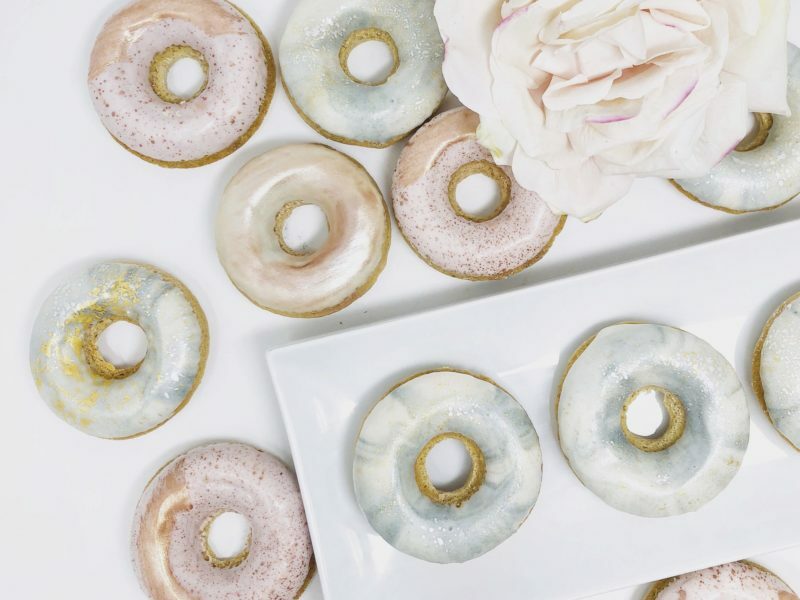 Gourmet baked doughnuts can match your wedding colours and accented with metallic details. Rent our walls to style doughnuts and wow your guests! Walls can be added to any dessert table or coffee station. Set boxed doughnut at place settings for guest ‘thank you’ favours. 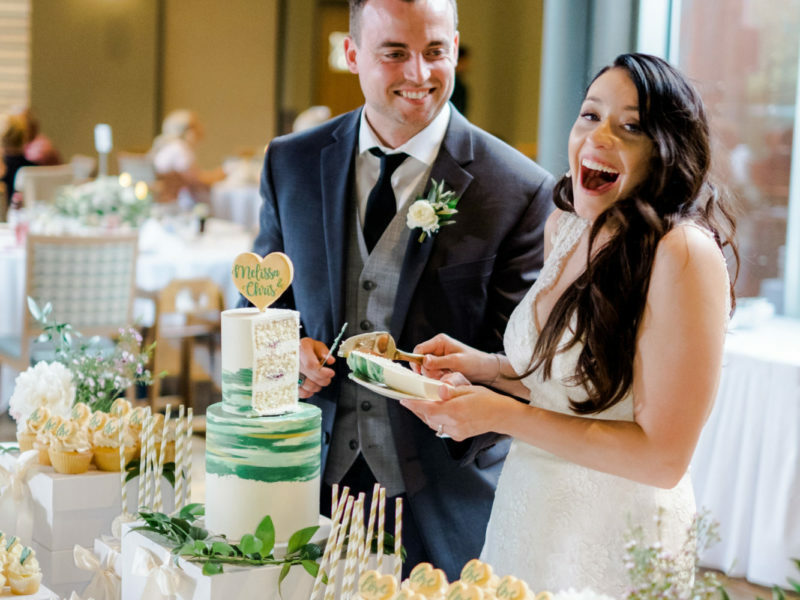 Our all-inclusive dessert tables each include a 2 tier wedding cake surrounded by a stunning display of menu items accented in your wedding colours and personalized with your names. All dessert tables include delivery, setup, styling, display boxes. 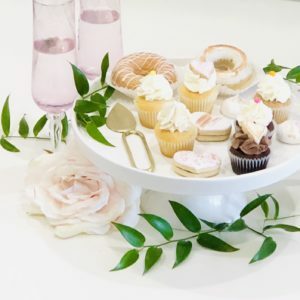 Design and style your own dessert table with all your favourite menu items or add more menu items to any of our signature Sweet Shoppe dessert tables. Cupcake & cake flavours, meringue buttercream icings & decadent fillings. Consultations $40 / 30 minutes for 2 guests. menu options, and sample a variety of cake flavours, doughnuts and treats! All consultation appointments will include a follow up email with a review of all details and quote. *If you book your wedding with us, $40 consultation fee will be credited to your wedding account.